Saskatoon Search and Rescue is gearing up for another big year! Come and find out more at the Annual General Meeting on January 30. There are several important topics being discussed and decisions to be made. More information will be sent to members via email in the very near future. Thanks to Lance Athmer and Rebecca Basset for hosting the prospective member's meeting in December and to all those who attended. Eight individuals will be taking the Basic Searcher Course in the new year and will be the first to take the course in its new format. It's exciting to bring in new people who have a diverse background in experience and interests. Two CBC documentaries related to search and rescue are worth watching! There are some changes to our 2014 training schedule (no date changes) and several other events to put on your calendar. NOTE: The January training will NOT include an overnight field day as originally scheduled. Your SSAR executive was very busy in December, meeting and continuing to develop good relationships with our community partners. There were many more aspects to "Exercise Domino" than what we were aware of just from reading and seeing the news last October. 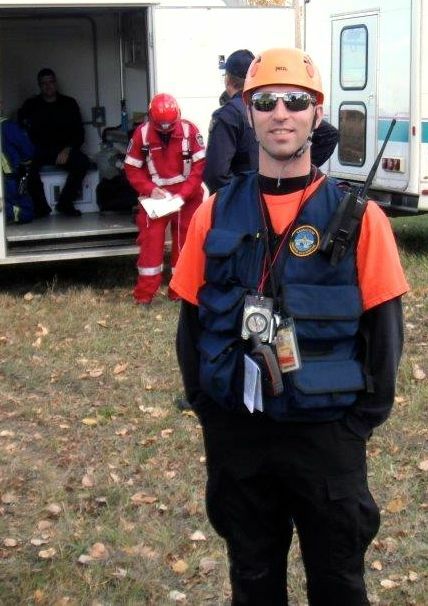 The Saskatchewan Research Council participated in the tabletop part of the exercise and later featured Saskatoon Search and Rescue and one of their employees (SSAR President Kent Orosz) in an article written for their Intranet. It is reproduced here with permission. What else would you like to see in the SSAR newsletter? Do you have something that should be included next month? Please email the Communications Director with your ideas, comments and feedback. Thanks! "A documentary about Canada's patchwork search and rescue system. Why is it sending out its own SOS call? As more urban adventurers seek recreational thrills than ever before, search and rescue teams are pushed to the limit trying to save them. GPS technology - and the assumption that help is just a cell phone call away - have changed the way we play, but the rescue system is chronically underfunded and struggling to keep up with the new demand. To the Rescue follows dramatic searches as they unfold, and finds a rescue system patched together with volunteers who risk their own lives to save others." If you missed the documentary Where Am I? about the skills we use to navigate, it's now available online and it got a great review! All Thursday evening training sessions are held at the Fire Training Centre, 114 Ave W S, unless otherwise specified. Field days are generally held the following Saturday. Starting in January 2014 the Basic Searcher course will be delivered over a four-month period through a combination of classroom and field sessions. The complete ERI (Emergency Response Institute) Basic Searcher curriculum will be covered in depth as well as additional material. This course is being held on the same dates and times as the regular training but is being run as a separate program. In addition to new and prospective members, existing members who would like to go through the new course are welcome to attend. The next four-month training cycle will be focused on preparing the chapter for the May exercise. Much of the training will be geared around searching in urban areas and the area bordering towns and cities. This will be done through short presentations, group discussions and tabletop exercises. We will be working to develop and finalize pre-plans and procedures and test these out prior to working with the Saskatoon Police Service in our May exercise. The dates for all training leading into the May 4, 2014, exercise are set, but the actual content/topics for training will be changing slightly as the actual exercise objectives are developed and finalized. January will be a discussion on pre-plans/SOPs, the nature of searching in an urban area where it turns into a remote search and the challenges that combination style search brings up. We will be also training on using some standard forms that will be completed at a team level. A full list of training dates for the next several months can be found on the Training page of our website. The Annual General Meeting (AGM) for Saskatoon Search and Rescue will be held on Thursday, January 30, 2014, starting at 7:00 pm at the Fire Training Centre at 116 Avenue W S. It is essential that all SSAR members attend in order to have a voice in your organization. At this meeting, reports will be presented summarizing the activities of the organization over the past year, new directions will be discussed, proposed changes to our Constitution and Bylaws will be voted on and nominations and elections of all Executive and Director positions will be held. This is the most important meeting of the year as it determines the directions we will be taking as an organization over the next year. If you are interested in getting more involved in SSAR, please consider running for one of the positions. Email us for more information or a list of positions and job descriptions. The next SSAR Executive and Directors meeting will be held on Thursday, February 27, starting at 7 pm. These are the business-style meetings of our chapter and are held the last Thursday of each month. All members are welcome to attend. If you would like to speak to an issue concerning SSAR, please notify the President prior to the meeting so time can be allotted on the agenda. If you would like a copy of the minutes from any past Executive and Directors meetings, please email us. In December, representatives of SSAR met with our police services of jurisdiction. On December 12 we attended a meeting with Saskatoon Police Service's Watch Commanders and other senior staff. SSAR's capabilities and what to expect of our members as we work together were the main points of the meeting and this also provided an opportunity for relations between our organizations to continue to develop. On December 19 we met with the RCMP "F" Division's Operational Coordinator for Search and Rescue. We discussed how to further our cooperation on searches and the possibility of doing a training exercise together in fall 2014. Both of these meetings were very positive and encouraging for the work we do. Saskatchewan SAR chapters were activated for six searches between September and December. Many others held a number of PSAR (Preventative Search and Rescue) presentations. Search and Rescue Volunteers Association of Canada (SARVAC) is currently working with the Canadian Standards Association (CSA) to develop national standards for SAR. These standards will be competency-based and will apply to volunteer Ground SAR, military-based SAR, professional rescue teams, and others. The review period is scheduled for January - February 2014. The Provincial Partnership Committee on Missing Persons (PPCMP) has designated May 4 - 10, 2014, as Missing Persons Week. A key component of the week's focus will be accidental drowning. This week also coincides with National Emergency Preparedness Week. The SARSAV Conference & Games previously announced for 2014 has been cancelled. The idea may be picked up again for 2015. The next SARSAV meeting will be the Annual General Meeting (AGM) on March 15, 2014. All current members of a Saskatchewan SAR organization are invited to attend. October 23, 2013 â€“ Earlier this month, several Saskatoon organizations including SRC were involved in a major disaster practice exercise. The â€œExercise Dominoâ€ as it was called, brought more than 30 organizations together to focus on an all-hazards model to test response methods and collaboration. Much of the Exercise Domino was a tabletop or virtual practice, but Saskatoon Search and Rescue (SSAR), along with various agencies such as the Saskatoon Police Service and Saskatoon Fire and Protective Services, were physically put to the test with a few evacuation and rescue exercises among other training activities. Kent Orosz, an associate scientist with SRC Environmental Remediation, has been president of SSAR for three years. As part of the exercise, he had the opportunity to take part in a mass evacuation of a seniorâ€™s complex. Working with several task forces to test the interoperability of emergency strategies, the group also took part in three separate virtual evacuations as well. â€œThe reason it is called a Domino is that you immediately know the effect of one piece falling,â€ explained Kent as he recounted the experience, discussing the importance of teams learning to work together in an emergency. Based out of the City of Saskatoonâ€™s operations centre, SSAR functioned as a support team during the exercise to provide â€œextra boots on the ground.â€ Thanks to a recent donation, SSAR also owns seven GPS units which enabled them to provide navigation during the rescue activities. SSAR currently has 28 search-capable volunteers, but this number has fluctuated over the years. Having a strong and capable team is a point of pride for Kent, who has been involved with the organization since its inception. When Kent was in university, he found he had a strong desire to help in the community. He was looking for opportunities to provide disaster relief or some sort of service to those in imminent need of help. He was attracted to the work that the military does during states of emergency, so he joined the Army Reserves. As a new recruit, he did his basic training on weekends, but he was finding the schedule a bit grueling with his full-time studies and he wasnâ€™t sure that the Army was the right fit for him. He left basic training, but still felt he wanted to find a way to contribute. About a year later, he received an email inviting him to an emergency services volunteer fair; SSAR, a brand new organization, was one of the presenters at the event. The rest is historyâ€¦ As a founding member of SSAR, he became a team leader within a month and was a trainer for the program within half a year. In 2010, Kent took on the role of acting president and was elected to the position shortly afterward. In his time as president of the organization, SSAR has solicited a $30,000 donation from the Kinsmen Club of Saskatoon to purchase a command post trailer. The organization has also received a $4,000 donation from the Dakota Dunes Community Development Corporation which helped them purchase their GPS units. Kent is proud of the successful fundraising campaigns and of building a strong and dedicated team. In the beginning, SSAR attracted 82 members, but that number decreased drastically as the organization went through some growing pains. Under his leadership, SSAR has trained and developed a strong and dedicated team that has been helpful when the group is called upon in practice and real-life situations. Members meet twice monthly for training. 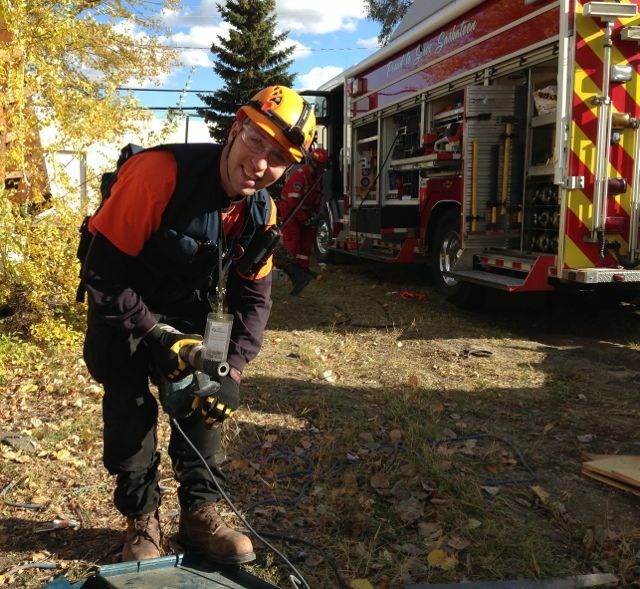 Over the past few years, the group has taken part in a search scenario along the South Saskatchewan River, urban missing subject scenarios in different neighborhoods which included door-to-door interviewing and a multiple-casualty exercise in Nisbet Forest near MacDowall, Saskatchewan. â€œOur SSAR training teaches us to have an adaptable mindset and strong navigation skills â€“ not to mention emergency first aid and other safety skills,â€ he says. These skills are all useful when there is a real situation that requires assistance from SSAR. Since 2009, real-life situations required SSAR to search for missing subjects in the Saskatoon region, sandbag to prevent flood damage in Borden, standby for search and rescue after a tornado in Kawacatoose First Nation, standby for cleanup assistance after widespread flooding in Yorkton and provide passenger notification of transit stoppage after a blizzard in Saskatoon. Copyright Â© 2013 Saskatoon Search and Rescue, All rights reserved.